Did you know that Spongebob Squarepants began life as an educational tool? Long before our favorite underwater oddball moved into his pineapple under the sea in Bikini Bottom, he was “Bob the Sponge,” a character in a comic book about marine life given to visitors of an ocean research facility in California. That seems like a far cry from the lovably bizarre adventures we’ve come to know since Mr. Squarepants came to television. But after all, everybody has to start somewhere. Educational roots aside, Spongebob Squarepants is all about fun. That’s why he’s been such a pop culture staple for nearly two decades, and why he’s just as popular with grown-ups as he is with kids. Not every cartoon-themed costume is available in adult sizes, after all. But when it comes to Spongebob and his pals, the appeal is definitely an all ages thing. Maybe it’s a sign that a lot of adults would secretly love a chance to run off and start a new life in an underwater pineapple. Or maybe it’s just that everybody likes a good laugh. 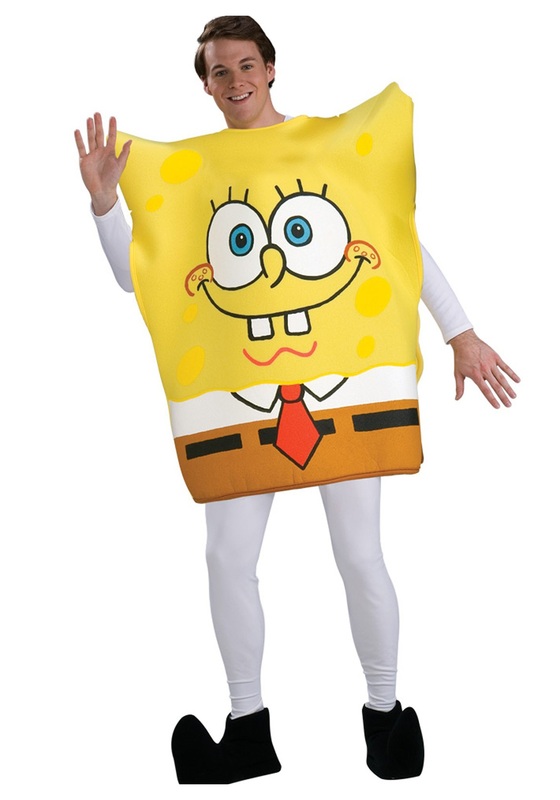 Whatever your motivation, this officially licensed Spongebob Squarepants costume has you covered the next time you feel like taking a walk on the wet side. The polyester tunic features Spongebob’s familiar face grinning out at the world, with a pair of foam shoe covers to replicate Mr. Squarepants’s signature footwear. Spongebob himself may have gone through some changes over the years, but he’s still a one-of-a-kind weirdo whose face will spread smiles around the neighborhood.